Alzheimer’s disease is a degenerative brain disease that causes significant memory loss and impairs a person’s ability to carry out daily tasks. Scientists have not found a cure for the disease, and experts continue to research what causes the disorder and how to prevent it. But researchers have identified some potential risk factors as well as medications and lifestyle changes that may help patients manage behavior problems and slow progression of the disease. Experts believe more than 5.5 million Americans are living with the disorder, according to the National Institute on Aging. The Centers for Disease Control and Prevention, or CDC, projects this number to nearly triple to 14 million by the year 2060. The disease most commonly affects people who are over 60 years old. Even though a person’s risk of developing the disease increases with age, the disorder is not a normal part of aging. Scientists believe many different genetic, health, lifestyle and environmental factors may influence when and how the disease develops. There is currently no cure for Alzheimer’s disease. People who suffer from the disorder eventually require full-time care. Alzheimer’s disease is a brain disorder that gradually destroys thinking and memory and ultimately prevents a person from doing their normal daily activities. The decline associated with the disease usually worsens slowly over a time. The resulting memory loss and thinking impairment are irreversible. There are two different types of Alzheimer’s disease: early- onset and late-onset. Late-onset Alzheimer’s is the more common of the two and symptoms usually begin appearing in a person’s mid-60s. Signs of early-onset Alzheimer’s begin to appear between a person’s 30s and mid-60s. Very subtle changes happen in the brain long before the first signs of memory loss related to Alzheimer’s disease appear. Researchers believe damage to the brain begins a decade or more before its effects are apparent. “During this preclinical stage of Alzheimer’s disease, people seem to be symptom-free, but toxic changes are taking place in the brain,” according to the National Institute on Aging. Abnormal levels of beta-amyloid, a naturally occurring protein, build up in the brain and form plaques between nerve cells. Another naturally occurring protein, tau, collects inside nerve cells and creates neurofibrillary tangles, or twisted fibers. These toxic buildups of protein prevent the nerve cells, or neurons, from transmitting information as they otherwise would. They lose connections with other nerve cells and die over time. Brain damage related to Alzheimer’s disease seems to start in the hippocampus, which is the area of the brain responsible for forming memories. As the disease progresses, other areas of the brain are also affected and begin to shrink. By the disease’s final stage, the damage is widespread and brain tissue has radically shrunk. Doctors use a cognitive assessment to diagnose Alzheimer’s disease. A person must have gradual memory loss and progressive cognitive impairment to be diagnosed with the disease. Symptoms of the condition must be severe enough to interfere with a person’s usual daily activities. Other types of dementia, such as Huntington’s disease and Parkinson’s disease, or other conditions such as depression, can be ruled out using various medical tests. Doctors may order blood and urine tests and perform brain scans to discount other possible causes for a person’s symptoms. They will also want to know the patient’s medical history and a list of all the drugs, vitamins and supplements the patient takes. Doctors cannot definitely diagnose a person with Alzheimer’s disease until an autopsy can be performed after death. But on occasion, doctors can use a living person’s biomarkers, or measures of what’s going on in the body, to diagnose the disease. People who suffer from memory problems should see their doctor once or twice a year, the National Institute on Aging says. A primary care physician may refer a patient to one or more specialists, such as a geriatrician or a neurologist. The stages of Alzheimer’s disease are usually broken down into three classifications to describe its progression: mild, moderate and severe. Each patient moves through these stages at a varied pace as the disease affects everyone differently. Doctors may use the Global Deterioration Scale, developed by Dr. Barry Reisberg, to explain the stages of cognitive function for those suffering from a primary degenerative dementia such as Alzheimer’s disease. The seven major clinical stages are broken down in the following chart. No one factor has been determined to be the root cause of Alzheimer’s disease. But scientists have pinpointed several risk factors that likely contribute to when the disease begins and how it progresses. If these risk factors are present, a person might have a greater chance of developing the disease. For example, a 2010 study published in the medical journal Neurology suggested Type 2 diabetes and resistance to insulin increase the risk of developing plaques associated with Alzheimer’s disease. And the National Institute on Aging says a family history of Alzheimer’s disease does not mean a person will definitely develop the disease, but it may mean the person has a higher chance of having it. Researchers have not pinpointed a gene that directly causes late-onset Alzheimer’s disease. But having one form of the apolipoprotein E (APOE) gene on chromosome 19 does increase a person’s risk, according to the National Institute on Aging. The early-onset form of the disease is sometimes caused by an inherited change in one of three genes: APP, PSEN1 and PSEN2. Some research suggests it is possible for early-onset Alzheimer’s to be caused by genetic changes that occur outside of these three genes as well. Aside from genetic influences, studies have suggested that gum disease bacteria, lack of sleep, proton pump inhibitors or iron buildup from like consuming red meat, among other things, may be contributors to the development of the disease, although findings are mixed and scientists still do not know for sure. A 2019 study published in the journal Science Advances found Porphyromonas gingivalis in the brains of people with Alzheimer’s disease. The type of bacteria is involved in gum disease. In addition to the bacteria, scientists also found evidence of gingipains, which are toxic enzymes produced by the bacteria. Although earlier studies also support a link between gum disease and the brain disorder, Business Insider reported that some experts are being cautious about the most recent findings. Director of scientific engagement for Alzheimer’s Association, Dr. Rebecca Edelmayer, told CBS News that there’s not enough evidence to definitively say the bacteria causes Alzheimer’s. She said the recent research suggests an association, not causation, and more research is needed. Neurobiologist Dr. Robert Moir, of Massachusetts General Hospital, told Science Magazine he’s not convinced the bacteria causes Alzheimer’s, though he said it could be a contributing factor. The study was sponsored by Cortexyme Inc., a privately held pharmaceutical company. As part of the study, researchers experimented on animals with a drug that helped reduce the amount of gum disease bacteria and block the production of amyloid beta in the animals’ brains. Gum disease can contribute to a number of health problems, including heart disease, premature and low-birth weight babies, and rheumatoid arthritis. In January 2019, Washington University School of Medicine put out a press release about study findings that indicate lack of sleep could speed up the progression of Alzheimer’s disease while good sleep habits could help maintain brain health. Researchers at the school in St. Louis discovered lack of sleep increases levels of tau, a protein associated with Alzheimer’s disease. Poor sleep also contributed to the spread of tau tangles, which cause brain damage and dementia, in the brains of mice used in the study. When people were kept awake all night during the study, tau levels increased by about 50 percent, researchers found. Senior author of the study and head of the medical school’s neurology department, Dr. David Holtzman, said it is still unknown whether good sleep habits will protect against the development of the disease as people age. But the new research suggests it might help slow the progression of the disease once it has started. A 2013 study suggested iron accumulation may contribute to the cause of Alzheimer’s disease. Researchers from the Semel Institute for Neuroscience and Human Behavior at UCLA used an MRI technique to measure the amount of iron in the brains of 31 people with Alzheimer’s disease and 68 people with healthy brains. They wanted to find out whether elevated tissue iron caused the tissue breakdown associated with the disease, according to a UCLA press release. The study’s authors say they were able to determine that the increase in iron in the brain was occurring with the tissue damage. They published their findings in the Journal of Alzheimer’s Disease. Senior author of the study, Dr. George Bartzokis, said environmental factors such as how much red meat a person eats can influence the buildup of iron in the brain. Other factors include iron dietary supplements and, for women, having a hysterectomy before menopause. In April 2016, JAMA Neurology published a study that concluded avoiding proton pump inhibitors may prevent dementia. Known as PPIs, these acid-reducing drugs are intended to treat symptoms of gastrointestinal disorders such as gastroesophageal reflux and peptic ulcers. As part of the 2016 study, researchers analyzed information that a large German health insurance database had collected from 2004 to 2011. They looked at observational data for more than 73,000 people who were 75 years old or older. The analysis lasted for about three months in 2015. The patients who had been regularly taking a PPI, such as omeprazole (Prilosec), pantoprazole (Protonix), lansoprazole (Prevacid), esomeprazole (Nexium) and rabeprazole (AcipHex), had a significantly increased risk of incident dementia compared with patients who did not take the medication. PPI drug labels warn that patients who have taken the medication for more than three years are at risk of vitamin B12 deficiency. Difficulty thinking and reasoning or memory loss could be symptoms of low vitamin B12. Scientists concluded the results were in line with data from mouse models that showed increased levels of amyloid beta proteins in the brains of mice that were exposed to PPIs. But the researchers also noted more trials were necessary to further examine the suggested connection. Subsequent data from at least four studies, including results published in October 2017 in Gastroenterology, the official journal of The American Gastroenterological Association, do not support the suggestion that PPIs increase dementia risk. “Our data should provide some reassurance to individuals who require these highly effective medications for long-term treatment,” study authors Dr. Paul Lochhead and colleagues wrote in 2017. The first sign of Alzheimer’s disease is usually trouble remembering newly learned information. This is because the disease typically starts in the part of the brain related to learning. Some people with memory problems could have a less serious condition called mild cognitive impairment, or MCI. People with MCI have more trouble remembering things than normal, but their symptoms are not severe enough to get in the way of everyday life. As people with MCI age, though, they are at greater risk for developing Alzheimer’s disease. But not everyone with MCI will develop Alzheimer’s, and some experience restored cognition. Alzheimer’s often progresses slowly, and symptoms may be minimal in the beginning. But, eventually, the disorder seriously impacts a person’s ability to carry out their normal daily activities. As the disease worsens, patients may not recognize family members. They might also have trouble speaking, reading or writing. People with the disease in the later stages often need help with even the most basic tasks, such as getting dressed, brushing their teeth or hair, or preparing and eating meals. There is no cure for Alzheimer’s disease. There is also no one drug or intervention likely to successfully treat the disease. Treatment is therefore aimed at improving the patient’s quality of life. With medications and lifestyle changes, patients may maintain mental function, manage behavior problems and slow the progression of the disease. Treatment might involve the use of different medications. Some medications have been shown to treat some patients’ symptoms, but they do not treat the disease itself, meaning they cannot stop the damage to the brain cells. All medications used to treat the disorder belong to a class of drugs called cholinesterase inhibitors. Side effects of these medications include nausea, vomiting, diarrhea and loss of appetite. In rare instances, the medications have also been linked to fainting, seizures, depression or personality disorders, urinary incontinence, hallucinations, severe muscle pain, abdominal pain, gastrointestinal complications or bleeding, and cardiovascular conditions such as heart block. Cholinesterase inhibitors interact with anticholinergic drugs such as Promethazine, which is used to treat allergy symptoms and some nausea and vomiting. Other anticholinergic activity drugs include Parkinson’s medications, Benadryl and Symbyax. The Alzheimer’s medications also interact with similar neuromuscular blocking agents, cholinergic agonists and succinylcholine, which is a paralytic. People in the later stages of Alzheimer’s disease require around-the-clock care. Family members or friends caring for a person with the disease can be affected emotionally, physically and financially. 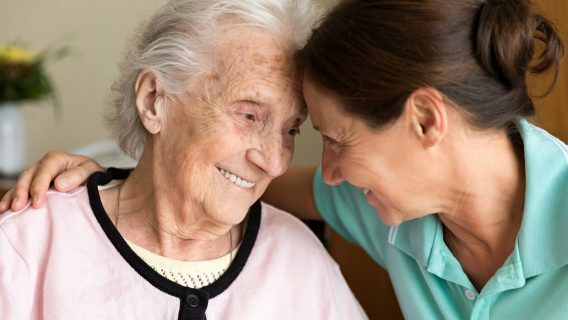 Caregivers may have to make tough decisions for their loved ones, such as deciding whether placement in a care facility is necessary at any point during the disease’s progression. Many reliable materials offer information on ways to help care for a person with Alzheimer’s disease, but caregivers are often neglected. The National Institute on Aging offers caregivers some tips for caring for yourself. Studies have not proven a hard and fast approach for preventing or delaying dementia caused by Alzheimer’s disease. But scientists have found encouraging evidence for some strategies. Staying physically active, keeping yourself mentally stimulated and controlling high blood pressure are possible preventions, according to the National Institute on Aging. Researchers are conducting clinical trials to test these and other theories. Your doctor can offer some suggestions on lifestyle changes to help your brain stay healthy and your body stay fit as you age. Scientists are still working to understand Alzheimer’s disease, including what causes it, how to prevent it and how to treat it. The National Institute on Aging leads Alzheimer’s research efforts for the federal government. People with or without the disorder and of all different ages, sexes, races and ethnicities are needed for clinical trials. Results from these trials are necessary to help scientists understand how the brain changes in both affected and unaffected people. In 2016, at least 70,000 participants were needed in more than 150 active clinical trials and studies related to Alzheimer’s disease diagnosis, treatment and prevention. Several clinical trials are looking at how aerobic exercise may affect brain health. More than a dozen clinical trials are evaluating the effects of smartphones, speech-language therapy, Minecraft, intense piano training and other cognitive training. Some researchers are conducting studies that combine physical and mental exercise while others are testing medications, hearing aid placement and other interventions. National Institute on Aging. (2017, May 17). Alzheimer's Caregiving: Caring for Yourself.